The HotBox EXA! With 7x 15W high power LEDs loaded into a compact fixture, users can archive the sweetest mixed colors or the warmest of whites. In the mood for something a bit eerie? Throw in some UV for psychedelic bliss. Strategically placed connections allow for the HotBox EXA to shine bright in ANY position, including flat on the floor. 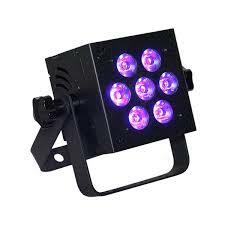 Use ‘em for uplights, truss warmers, and more!